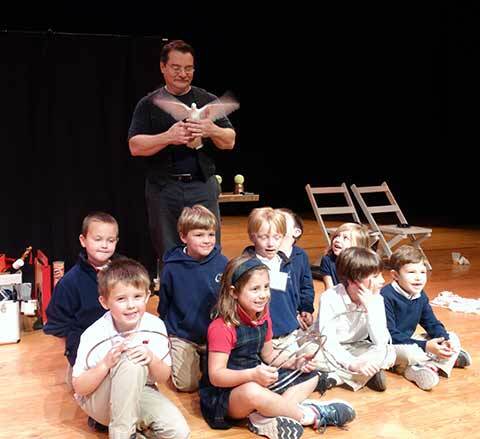 RFA’s Arts for Youth program brought magician John Kingry to Lancaster County Primary and Middle School students in November 2016. To the delight of these children, he entertained them with illusions, sleight-of-hand and magical rings. Many, such as those pictured above, were able to assist in the fun. The Rappahannock Foundation for the Arts is supported by the generous contributions of donors, by On Stage season subscribers, and by corporate and business sponsors of programs and events. RFA is a non-profit 501(c)(3) organization. All contributions are tax-deductible as allowed by law. Arts for Youth – an annual series of professional performances for area primary and middle school students. For ways to support RFA or to make a contribution, click on one of the links below.